It's the changing of the leaves, the shifting of seasons, and the change from shorts to sweaters. Autumn in Elkhart, IN is the time when we start to ponder coming holidays, family time and the much anticipated winterizing of a home. When it comes to home maintenance there can be a multitude of things to consider, from a furnace to fascia a homeowner wants to be sure they have a solid home under them for the winter months. ​So how can one ensure that their home is in winter condition before that first snowflake descends? By calling up the professionals at Elkhart Gutter Pros to care for the outside of the home. Though most winterizing can be done on one's own from the IN-side perspective, many times it's prudent to contact the professionals for all things exterior. In this case, it's about making sure those gutters are well cared for so no water or debris ends up affecting the house and its structure. It's important to note that with any water build up, it can begin to eat away at a homes frame and anything around it. So when it comes to gutters, water retention there can be detrimental to a house's timber roof frame and the shingles. Which means that, though it may seem unimportant, well-kept gutters are key to ensuring a home is secure. The reason for opting for a gutter guard is simple, protecting the hard work that went into the gutter installation. Gutter guards fall into 2 different categories - gutter covers and gutter screens. In regards to screens, they are usually made of a wire mesh, nylon or foam (much like what has been listed above). 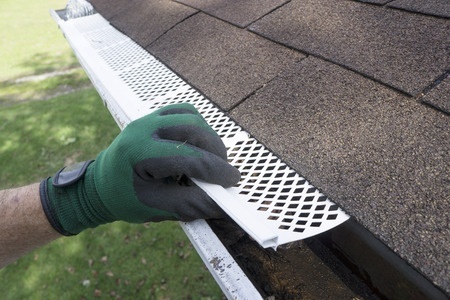 However, though they may be easy to install, they do not have the durability of other gutter guard options and would need to be replaced sooner rather than later. The other option is a Gutter Cover. This option sits on top of one's gutters, which would mean that aesthetics would need to be considered. Not to mention they also limit the water flow THROUGH gutters, so if there's a blockage, it could create issues. Which is why it's so important to have the experts install and inspect a home's gutters on a regular basis. At Elkhart Gutter Pros in Elkhart, Indiana we know how important it is to maintain not only the aesthetics of a home but also to be sure it will function properly.